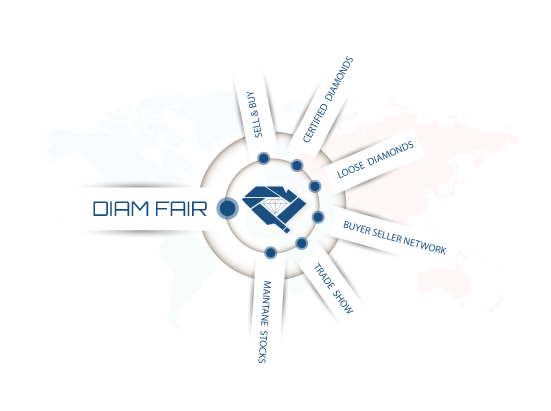 DiamFair is one platform which provides high quality service by creating a bridge between Diamond business industry and trustable buyers. DiamFair is most trustable and rigid platform which delivers giant diamond stock to their member, member directory access and impressive features to make their work easy and also make easy to connect with worldwide diamond businesses network. In other words, the service allows member to gain more control to buy diamonds closer to the source which means they don’t have to pay huge prices as branded diamonds without analyze diamonds listed by other business. Whether you into diamond buying or selling business DiamFair gives you whole market track and best prices to analyze and also made easy during the trade show with flexible mobile app which helps you make new business relationship and add to your business connection with you anytime anywhere. DiamFair has continuously in improving to increase more and more diamond buyers and suppliers to join this network since 2011 for applying business innovation to accomplish diamond business objectives, with an inventory beat 100000+ certified diamonds and Loose diamonds parcel with 7+ worldwide lab. We serve a board spectrum of diamond in sophisticated and merchandising goods. We are continuously expanding our reparation supported by some of the biggest name in diamond industries including sight holders.